Given the high sensitivity of the proposed development and the potential for the historical site uses to have impacted on site soils a contaminated land planning condition was attached to the decision notice for the redevelopment of the site. 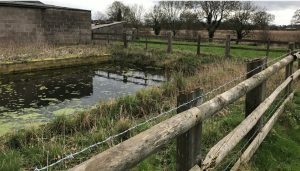 A desk study report prepared by others was submitted to discharge thew contaminated land planing condition with planning application 17/0724D which was rejected by the local authority and Demeter Environmental were commissioned to prepare a desk study report to satisfy the local authority. 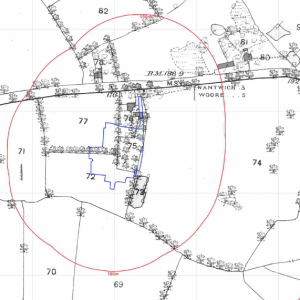 The review of the historical O.S maps revealed the first building on the site was present on he 1898 map, with the majority of the development occurring between 1909 and 1962 with some further development up to 1982. A pond was recorded to be present on the south eastern boundary of the site, which was in-filled between 1994 and 1995. A number of ponds were identified on the O.S maps within 250m of the site. Data from the Environment Agency and Groundsure confirmed that there were no landfills within 250m of the site and did not identify and other potential sources of contamination. On completion of the desk based review the site reconnaissance visit was undertaken, which revealed a number of agricultural buildings to be present on the site, mainly used for livestock. Damaged cement sheeting was recorded to be present across the site as well as a slurry pit on the south western corner of the site. The in-filled pond on the south eastern boundary of the site was inspected as part of the survey, the footprint of the pond could be discerned. 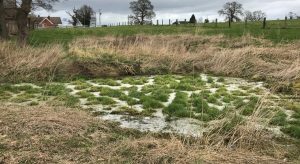 Based on the site observations the site buildings were discounted as a credible source as part of the qualitative risk assessment, leaving the slurry pit, adjoining in-filled pond and made ground on the site as credible sources. The report concluded that based on the limited history of the site remediation based on a reasonable worst case scenario as an alternative to further site investigation was suitable. The desk study report was submitted to support planning application 17/0724D and was accepted by email.